Easy Piano Solo. Composed by Various Artists. Piano Collection. French, Classical, Contemporary. Score Only. Composed 2002. Editions Salabert #SLB 00283600. 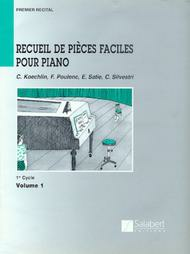 Published by Editions Salabert (HL.50483444). Marvelous petite collections of easy piano literature from some of France's best known twentieth century composers. These books are wonderful introductions to French music. Includes the works of Koechlin, Poulenc, Satie and Silvestri.